This April sees the second Chipping Norton Literary Festival, which will take over venues across town with an impressive array of events, workshops and performances. Chippy News is proud to announce that it will be one of the sponsors of this relatively new addition to the local events calendar. Last year, the inaugural “ChipLitFest” was very successful, drawing people from around the country to listen to authors talk about their work. This year looks like being even bigger and better, featuring acclaimed figures as Lionel Shriver, Jojo Moyes, Mark Billingham, Fern Britton, and… well, there’s so many of them that you’re better off checking the ChipLitFest website out for full details! This year, Chippy News will be sponsoring Rich Peppiatt’s show, One Rogue Reporter, which is on at The Theatre, Chipping Norton, on Friday 19 April at 7.45pm. Tickets for this, and the many other events, are available from The Theatre’s box office. 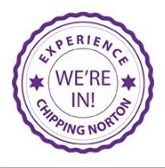 This entry was posted in news and tagged ChipLitFest, Chipping Norton Literary Festival, Chipping Norton News, Chippy News, Fern Britton, festival, Jojo Moyes, Lionel Shriver, literature, Mark Billingham, One Rogue Reporter, Rich Peppiatt, The Theatre. Bookmark the permalink.